If your watermelon doesn’t have a flat side that allows it to rest securely on the counter, slice a small portion of the rind off lengthwise to create a flat surface and stabilize it. Remove the cap from your vodka and use it to trace a hole on the top-center of your watermelon. Carefully cut around the circle with a sharp knife and remove the piece of watermelon rind. This is where the neck of the vodka bottle will fit while the fruit infuses. Save the piece of rind to use as a plug for later if you will be transporting the watermelon. Use a spoon to hollow out the area inside the hole so that there is room for the entire neck of the bottle of vodka. To test the fit, put the cap back on the bottle and turn it upside down, inserting the entire neck of the bottle into the watermelon. Make sure it can rest securely in this position. Take the bottle out of the watermelon and remove the cap. Right now the hole in the watermelon should be facing up towards you. Rotate the watermelon away from you about 90° so that the hole is facing straight out to the side. Carefully angle the open bottle of vodka and fully insert the neck of the bottle into the watermelon, moving quickly to minimize spilling. TIP: Do this at the edge of a table or counter so you can rotate the watermelon more than 90° so that it points downward. That way you can fit the neck of the bottle into the hole while the bottle is mostly upright. Carefully rotate the watermelon back to its original stabilized position so that the hole is pointing upward again. The bottle should now be completely inverted into the watermelon. 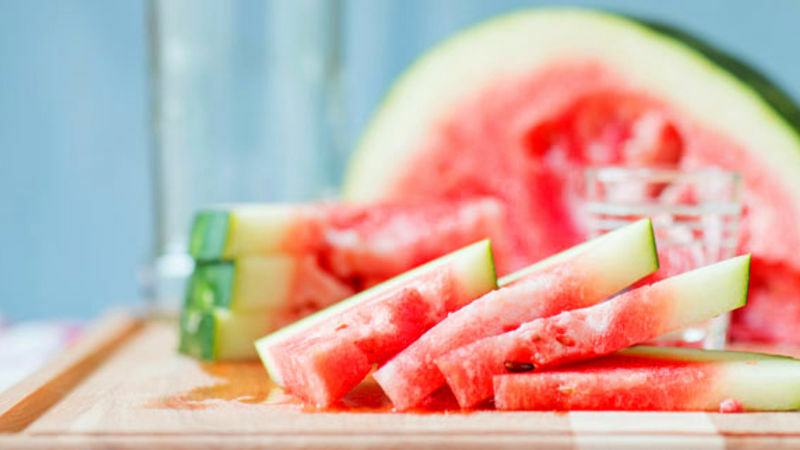 Allow watermelon to infuse for 12-24 hours at room temperature. 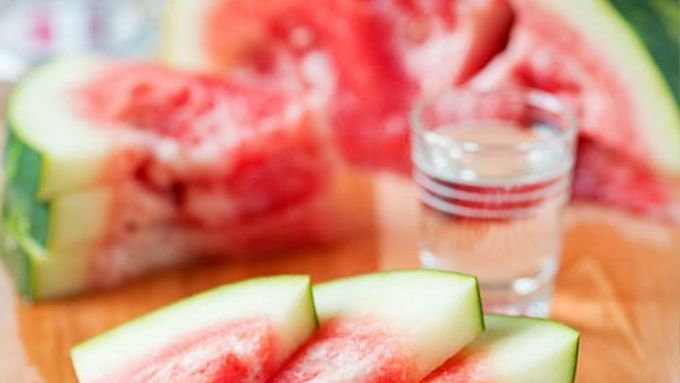 Once the vodka has infused into the watermelon, refrigerate until cold (if preferred), then cut into slices and enjoy responsibly! It's like DIY genetically modified food, but without having to be a mad scientist! This is a pretty awesome trick, and really easy to do. See for yourself! First off, you are going to need some supplies: vodka, watermelon, a marker, a knife, and a spoon. If you're lucky like me, you will find a watermelon that has one flat side, making it perfectly stable and ready for holding a bottle of vodka for 24 hours! If you can't find any deformed watermelons, no worries! Just find the flattest side, and slice a bit of the rind off to give it a flat surface. 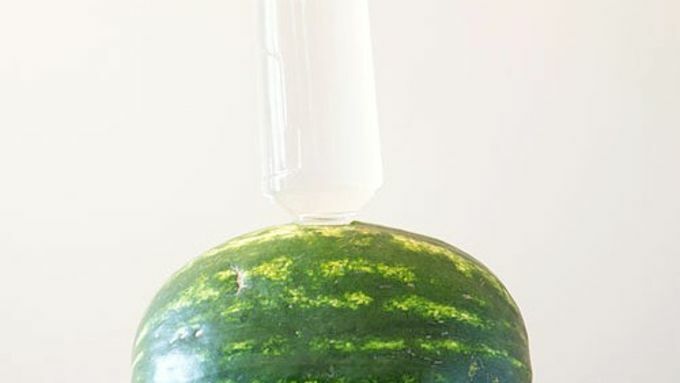 Once your watermelon has been stabilized, take the cap off your vodka bottle, place it at the top and center of your watermelon, trace a circle around it with a marker. With a sharp knife, cut around the circle, and remove your new "watermelon cork" (save it to plug the watermelon if you're transporting it!). Once you have your hole, take a spoon and clear out enough space inside the watermelon to fit the entire neck of the vodka bottle. Now here is the tricky part! First, put the cap back on the vodka bottle and insert it into the hole, making sure it can rest upside down in your watermelon. Once the hole is ready, rotate the watermelon so the hole is on the side (doing this on the edge of a table or counter would work great). Remove the cap, taking the bottle of vodka in your hand, lower it as far as you can without spilling, then insert it into the hole and rotate the watermelon back to its secure position. Congratulations! You have begun the infusion process. Now just let the watermelon and vodka sit for 12-24 hours at room temperature. If fruit flies are a concern, create a seal around the hole with plastic wrap. Once all of the vodka has infused into the watermelon, feel free to slice and serve immediately. If you prefer it cold, place the watermelon in the fridge for a few hours before serving. Enjoy your infused watermelon and remember to drink (/eat?) responsibly!